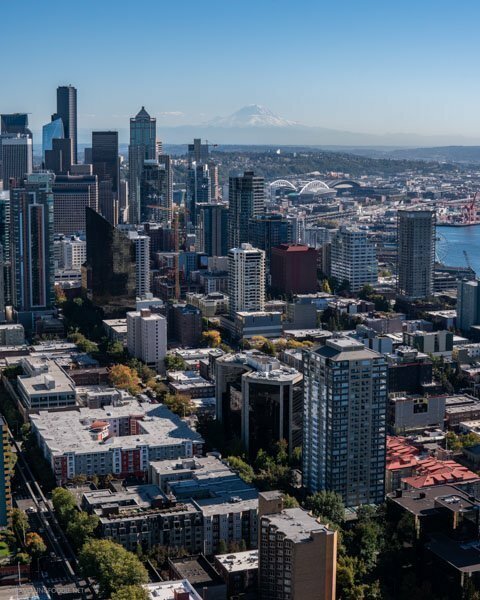 A seaport city on the west coast United States, Seattle is the largest city in both the Washington State and Pacific Northwest. Did you know? 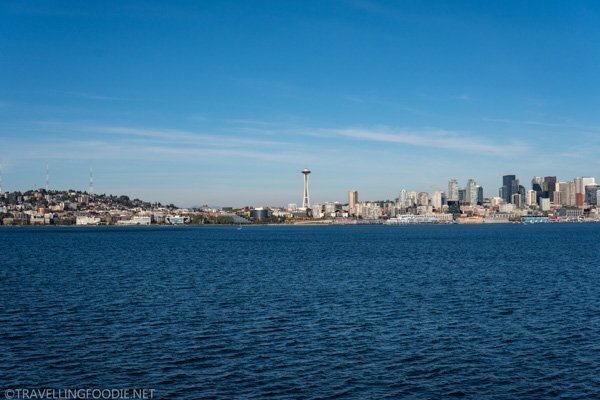 Seattle is the northernmost city in the USA. 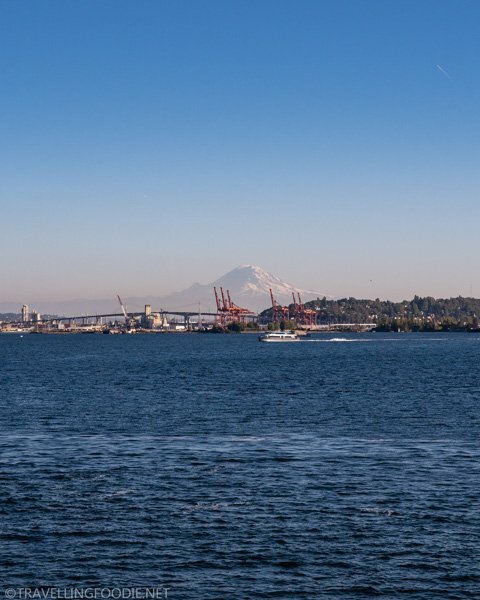 Seattle’s beauty lies on the fact that it’s surrounded by waters and mountains, specifically Mount Rainier which you can see from the distance from the city itself. The city is very walkable which makes it great for travelling foodies as you can mix attractions with the restaurants in one crawl. 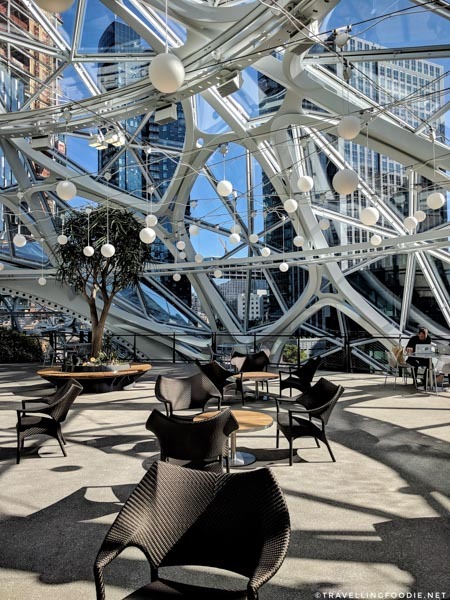 Along with the rising tech hub, there are some pretty interesting and unique things you can do in the city… and they are Instagrammable too. 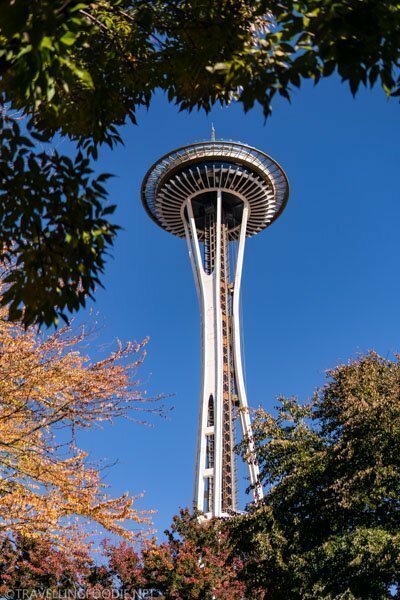 The most popular landmark in Seattle is the Space Needle, located at the Seattle Center. This 605′ tall structure has two levels of experiences. 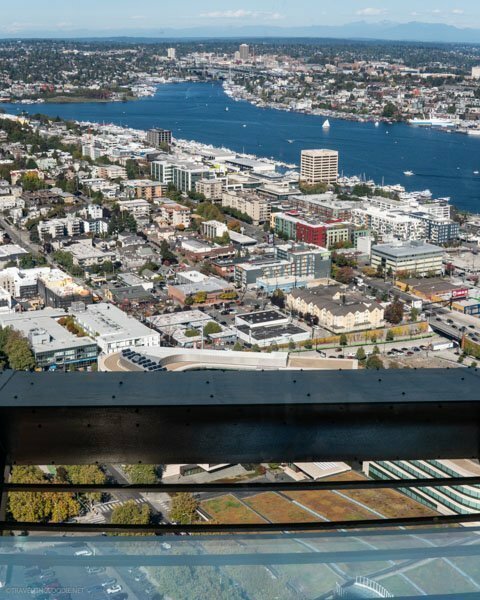 The main observation deck has floor-to-ceiling glass viewing experiences offering a 360-degree view of Seattle. I love that it’s an open air deck so you really feel the experience of being on top. 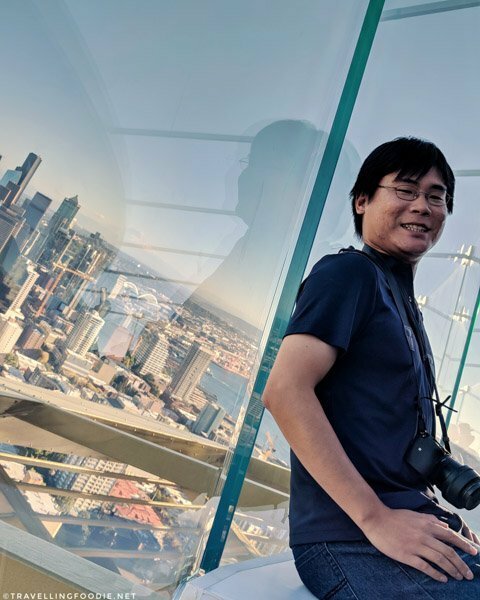 Another cool thing is the Skyrisers, which are tilted glass benches connected to the glass walls that make for perfect Instagram selfie shots. This is what it’s like sitting at the Skyrisers. 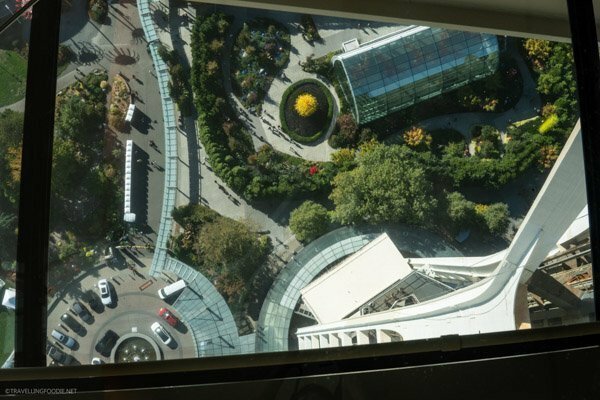 The connected lower level is The Loupe, which is the world’s first and only revolving glass floor 500 feet from the ground. 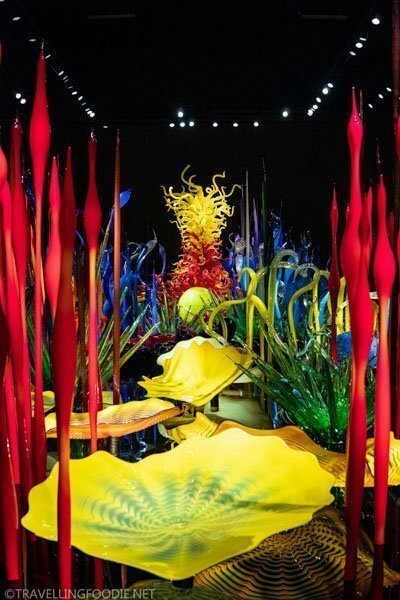 Another must-visit in Seattle located at the Seattle Center next to the Space Needle is the Chihuly Garden and Glass. 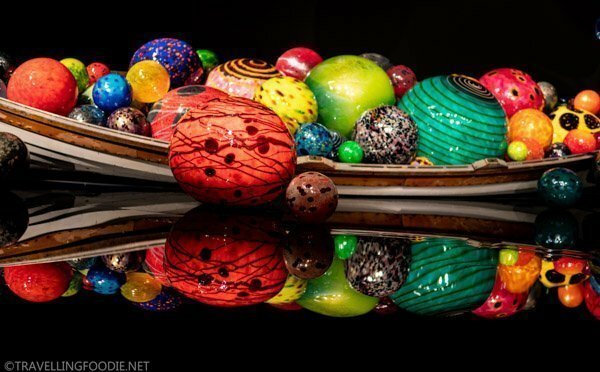 This museum showcases the beautiful glass art of artist Dale Chihuly, and teaches the inspiration and influences behind his craft. Did you know? 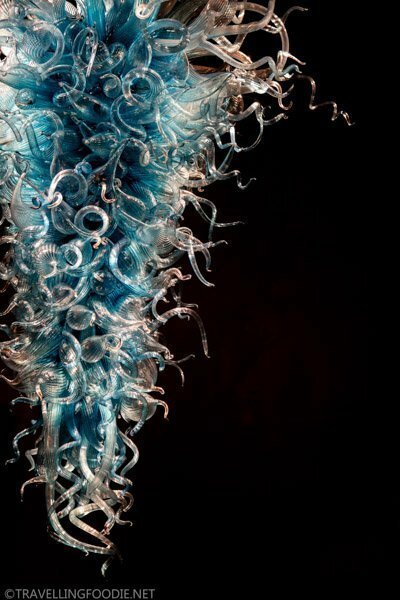 Dale Chihuly is a Washington native, but his works can be seen worldwide in more than 200 museum collections. 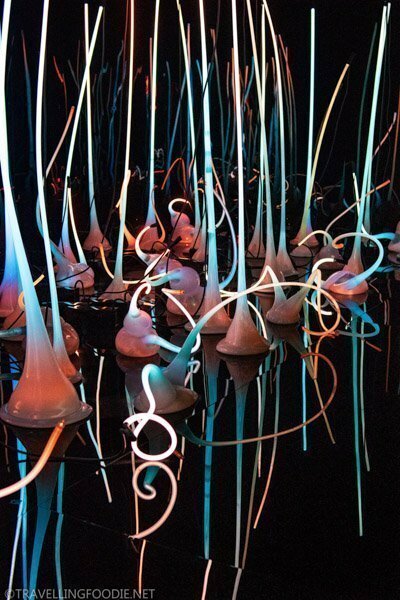 One of Chihuly’s earlier works, the Glass Forest is created by dropping molten glass from stepladders. 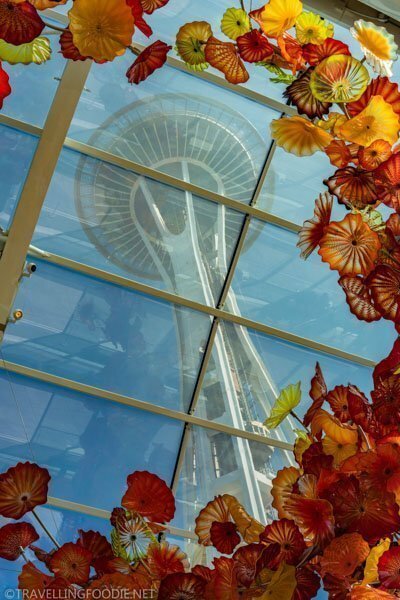 Travelling Foodie Tip: If you’re planning to do both Space Needle and Chihuly, they have a combo package that saves you money: $49 Regular, $44 Senior and $36 Youth. 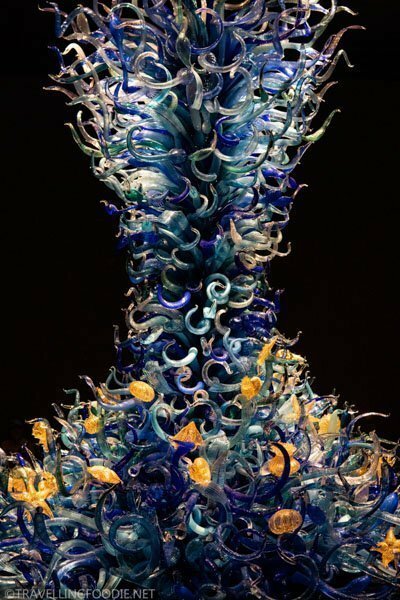 The museum has eight galleries, the centerpiece Glasshouse and a Garden – all with life-size glass art depicting various aspects of life from sea forms to gardens and flowers. The sealife tower stands as the centerpiece of the Sealife Room, reflecting the fluidity and water-like movement of glass. 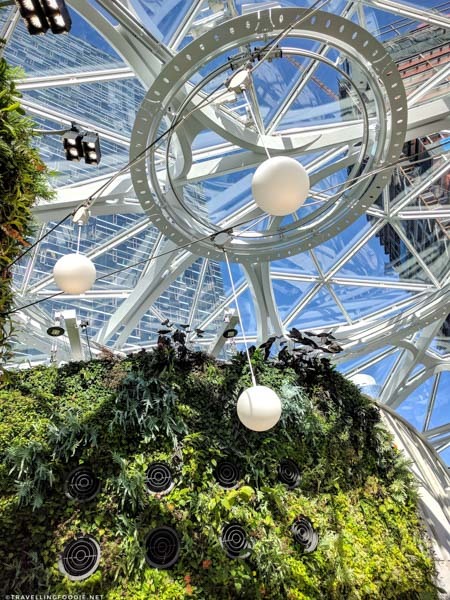 The most Instagrammable spot is the installation in the Glasshouse, a 100-foot long glass sculpture suspended on the 4,500 square feet space. 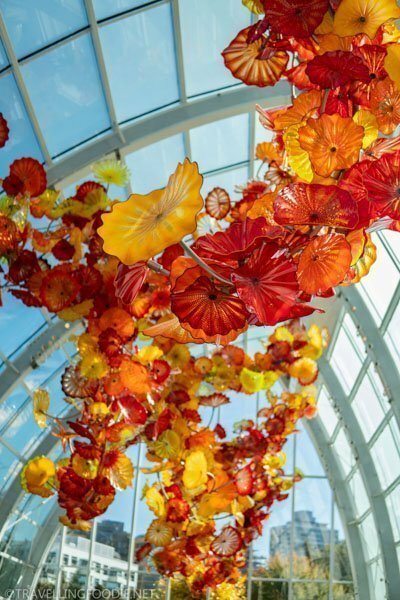 The sculpture is so vibrant with colors of red, orange, yellow and amber. 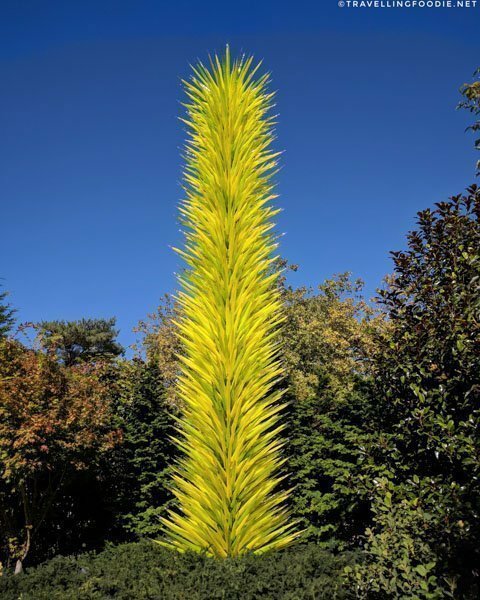 What’s beautiful is you can also see the Space Needle when you look up the Glasshouse. And if you stand on the right spot, you can frame the Space Needle with the glass sculpture. Be sure to also check out the Garden which is very unique because it blends nature and art together. The Pike Place Market needs no introduction especially for travelling foodies. 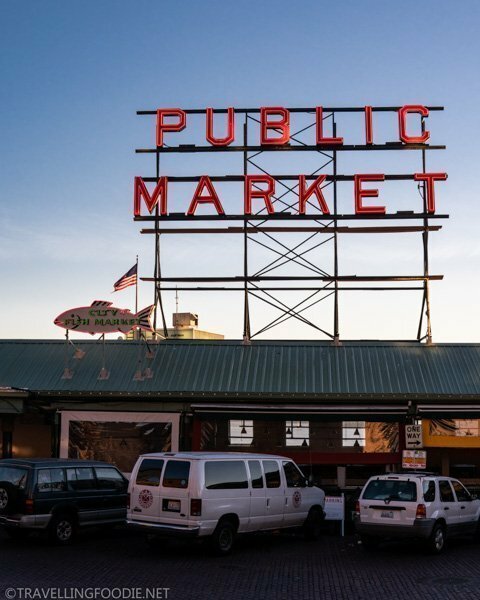 This public market overlooking the Elliott Bay waterfront is Seattle’s original farmers market and one of the oldest continuously operated public farmers’ markets in the United States, established in 1907. With its preserved and protected historic buildings and nine-acre historic district, there’s much to explore (and eat) in this market. You cannot miss the iconic sign which is all over Instagram. 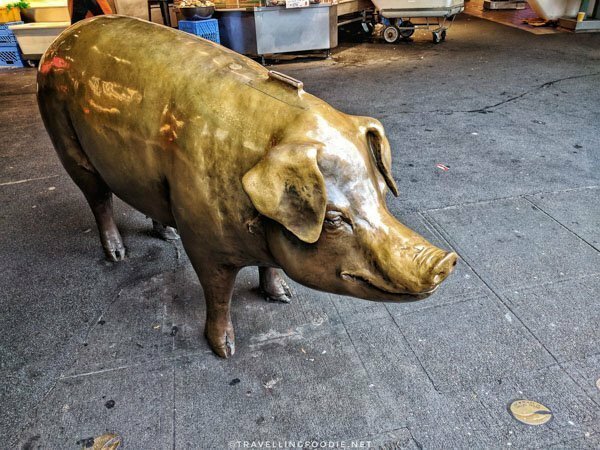 Be sure to also pay a visit to Rachel the Piggy Bank, the bronze cast mascot of Pike Place Market located beneath the Public Market Clock and Sign at the corner of Pike Place. Did you know? It’s been said that if you rub Rachel’s snout and make a donation, you’ll have good luck! Let me know if you’ve tried it (and if it worked). You can also visit the Victor Steinbreuck Park which has sculptures and overlooks Elliott Bay. 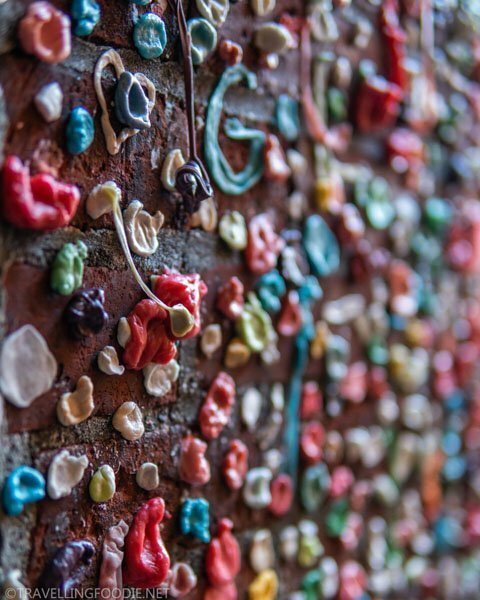 With its popularity, the Gum Wall in Pike Place Market deserves to be its own entry. This brick wall covered in chewing gum is definitely one of the weirdest (quirkiest?) attractions in Seattle. Did you know? 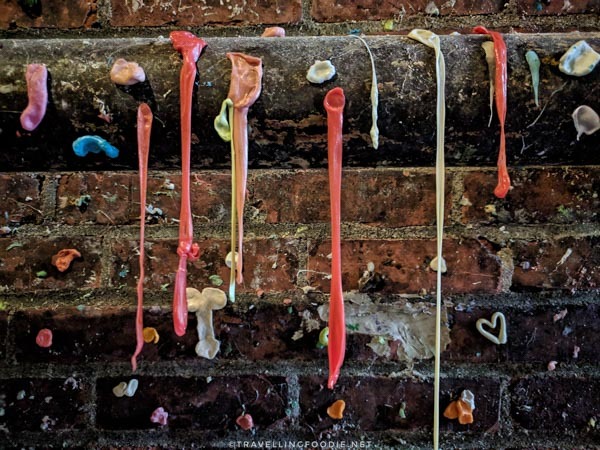 The gum wall has only been cleaned twice: first time in 2015, and the second in 2018! Apparently, an estimated one million pieces of gum was stuck on the wall during the first cleaning. 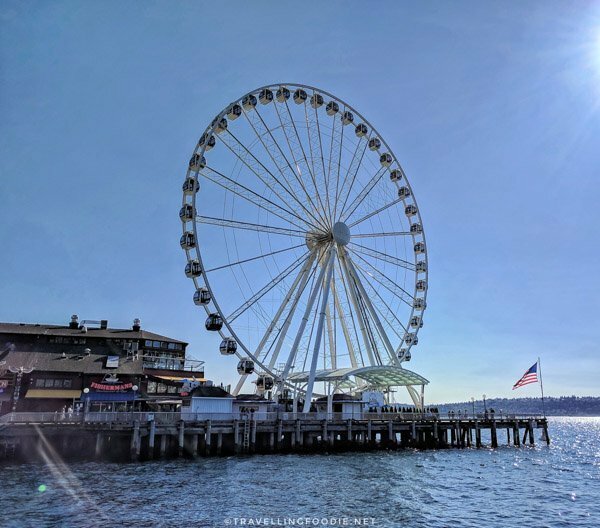 Located at Pier 57 on Elliott Bay, the Seattle Great Wheel is a 175-feet Ferris Wheel with a run time of 12 minutues with each gondola fitting 8 people. Did you know? It was the tallest Ferris Wheel on the west coast when it opened in 2012. 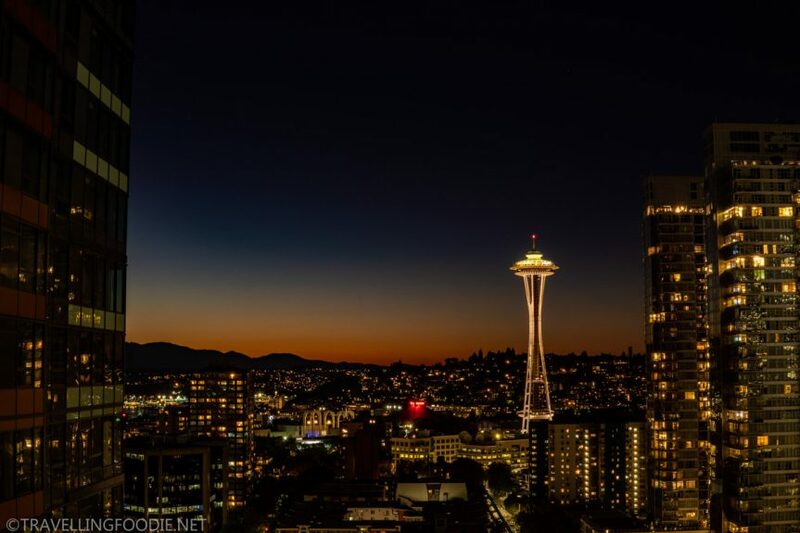 Be sure to see the Seattle Great Wheel at night when its 500,000 LED lights are illuminated. Every Friday, Saturday and Sunday, the ferris wheel has colorful light show displays. 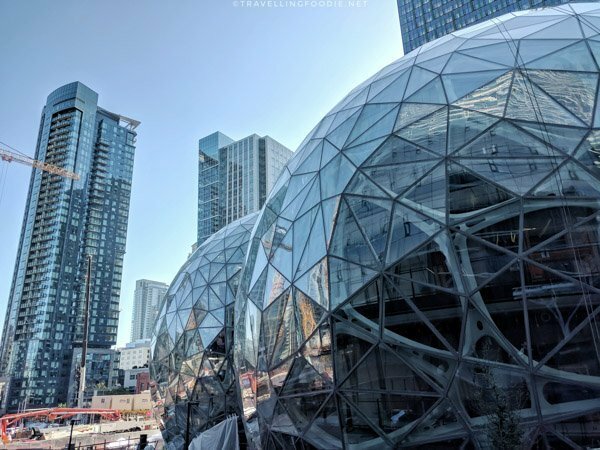 Most of Seattle’s tech hub is brought about by Amazon so it’s not surprising when Amazon decided to build the unique Spheres building, three spherical conservatories fused together to be home to more than 40,000 plants and over 700 species at any given time. Did you know? 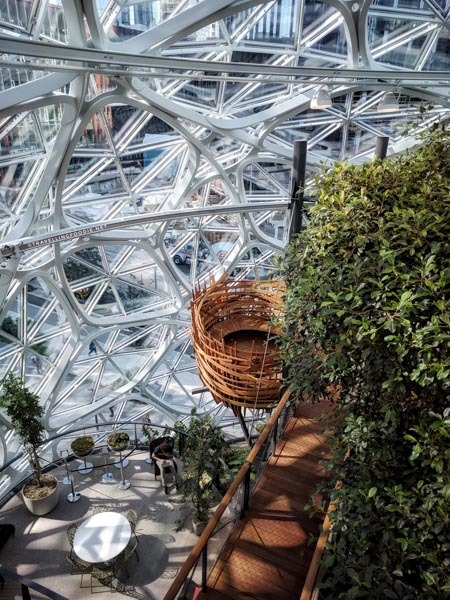 The Spheres was made for the employees as a place for them to think and work differently. Outside, there are public spaces that anyone can use including a dog park. They have a cool meeting room called the Bird’s Nest. The name is self-explanatory when you see it. 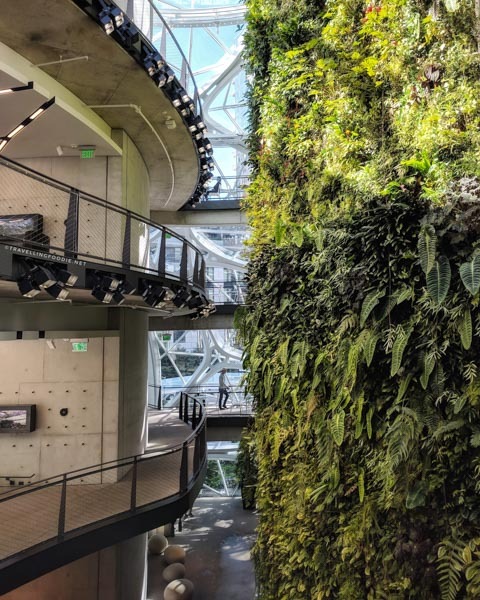 I was most amazed by the 60-foot-tall living wall covering 4,000 square feet with more than 25,000 plants. 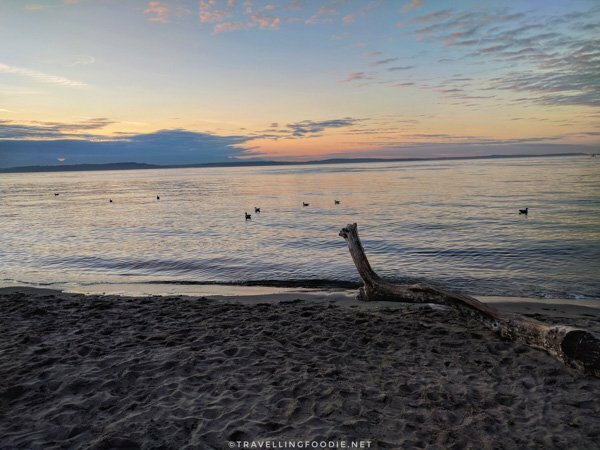 Alki Beach is Seattle’s closest beach that stretches for 2.5 miles in which you can find the Alki Point Lighthouse and a miniature Statue of Liberty. Did you know? 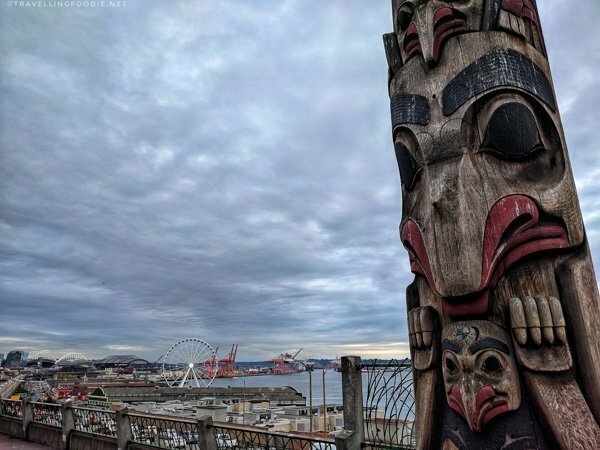 In November 1851, the first white settlers in Seattle landed on Alki Beach. Travelling Foodie Tip: An easy way to get to the beach without driving is by taking the West Seattle Water Taxi which stops at the eastern end of Alki Beach after a 15-minute ride. Sunset view. Leave only footprints on the beach. 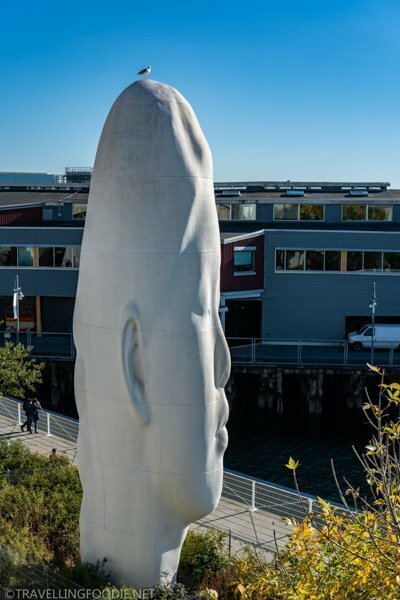 Created and operated by the Seattle Art Museum, the award-winning Olympic Sculpture Park is a 9-acre outdoor sculpture park with 21 sculptures. Best of all, it’s free and open to the public. Did you know? The Olympic Sculpture Park is the largest green space in downtown Seattle. 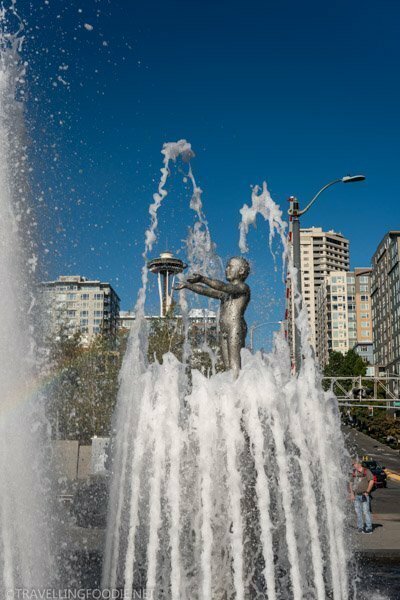 Father and Son by Louise Bourgeois (2004–2006): the father and son are engulfed in water and separated as the fountain’s water rises and falls. Travelling Foodie Tip: They offer free 60-minute guided tours throughout the year. Where to find the best skyline view of the city? That would be Kerry Park. 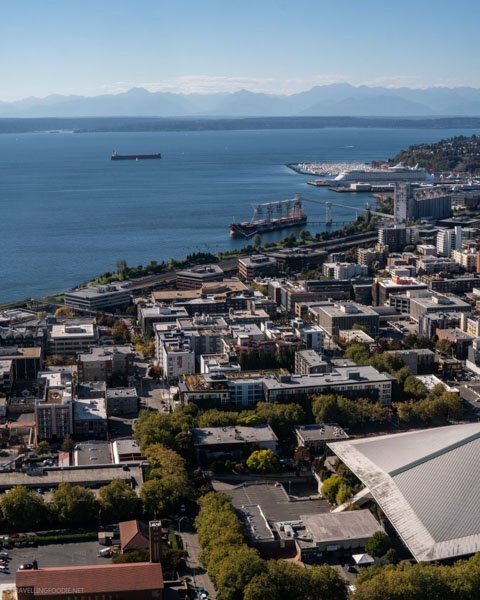 This 1.26-acre park will provide you with unobstructed views of Elliott Bay and downtown Seattle. If you get lucky, you might also see Mount Rainier on the backdrop. This one of the most popular spots in Seattle for photographers so be sure to come early to get parking and a good photo spot! I would say this is more of a viewpoint than a park because there’s not much in the park aside from the view. Price: Regular: $8.50; Senior (65+): $4.25; Youth (6-18): $4.25. Prices are round-trip. 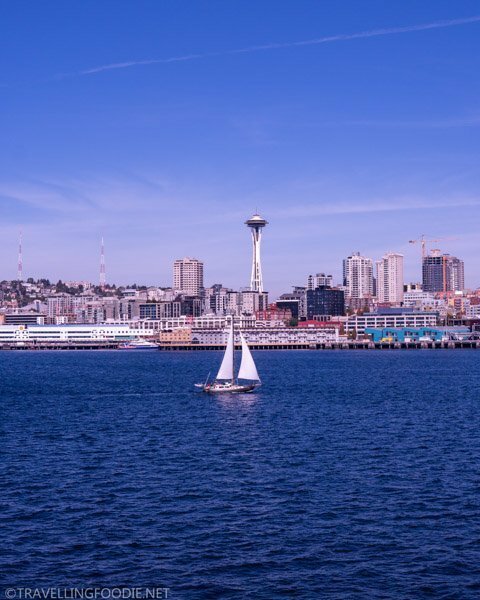 A great way to see Seattle from another perspective is by taking the Bainbridge Island Ferry. 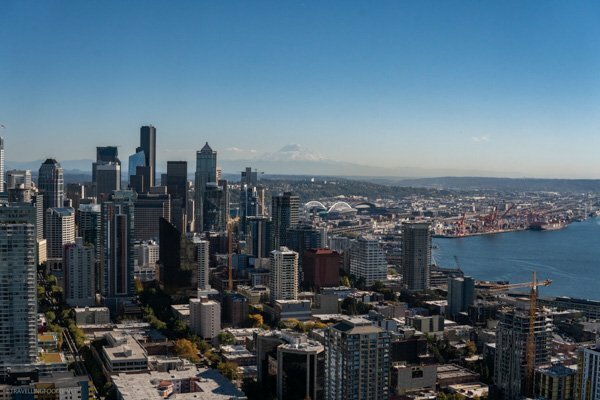 The 35-minute one-way ride gives you beautiful panoramic views of Seattle and Mount Rainier. Aside from that, this makes for a fun and short day trip to Bainbridge Island. Beautiful panoramic views to be had. 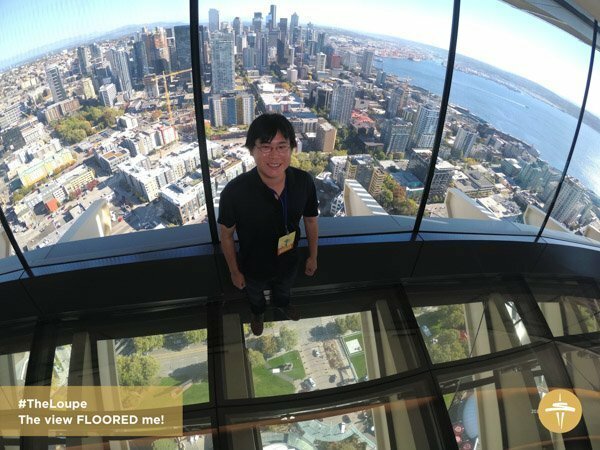 This really shows you how tall the Space Needle is! Travelling Foodie Tip: For maximum photo opportunities, do your round-trip ferry rides on different parts of the day. For example, arrive during lunch and leave for sunset or nighttime. Created in 1990, the Fremont Troll is a public sculpture in the Fremont neighborhood in Seattle. I love how creative this is as it made a tourist attraction out of a typically avoided area. 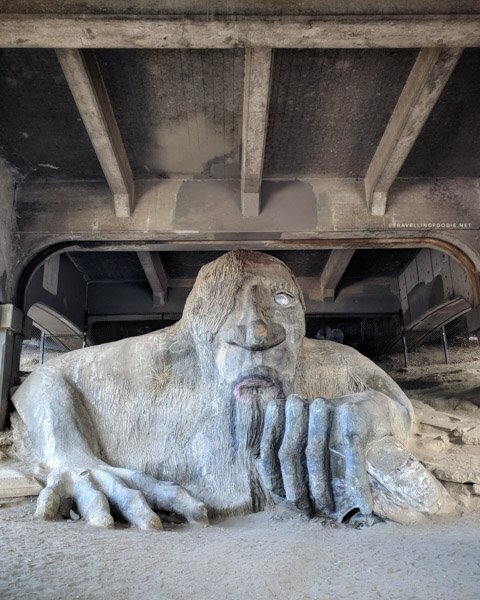 This 18-feet high troll under the bridge is based on a Scandinavian (Norwegian) folklore, Billy Goat’s Gruff, where three goats had to cross a bridge to get food but there’s a fearsome and hideous troll underneath it. 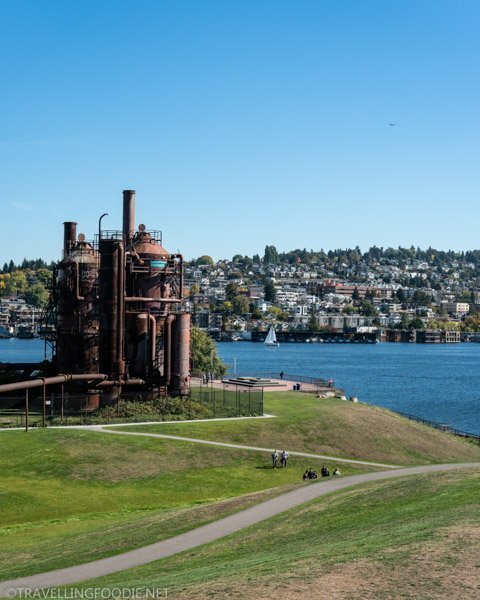 The Gas Works Park is a 19.1-acre public park that contains the only coal gasification plant in the United States. I love that they incorporated remnants of the plant on the park like the children’s play barn made by reconditioning the plant’s exhauster-compressor building. For awesome 360-degree views, climb Kite Hill, a small kite-flying hill with a sun dial on top. 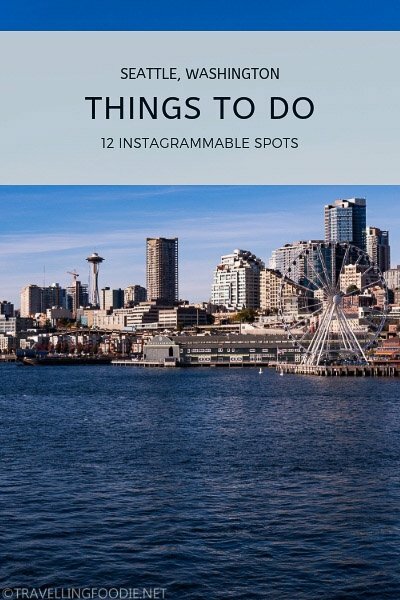 Hope this Seattle Travel Guide helps up your Instagram game with some of the best things to do and see in Seattle! What other spots did I miss? Let me know below! 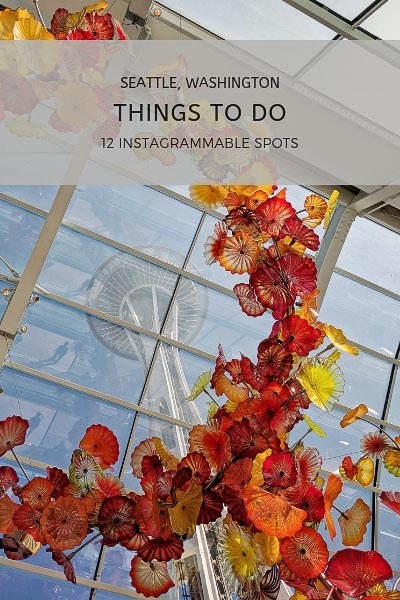 Posted on February 7, 2019 February 7, 2019 by Travelling FoodiePosted in Seattle, Travel, USA, WashingtonTagged guides, nature, sights and landmarks. 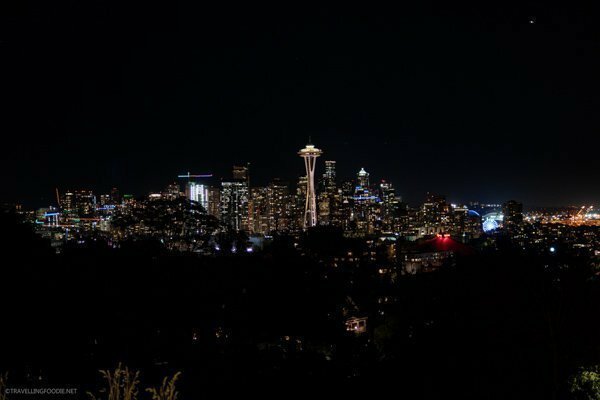 What a great city Seattle is. They had an unbelievable snow storm recently, did you see that? My brother has been there for a couple years and he said it was the most snow he’s ever seen. Yeah, my sister is currently living in Seattle and sent me some photos. I’m from Toronto though so what I saw was nothing compared to ours, but it’s definitely a lot for Seattle.